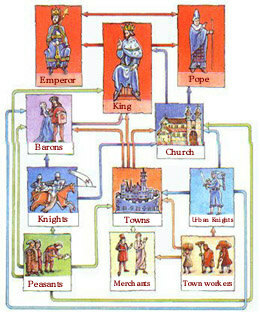 In most of medieval Europe, society was dependent on the "feudal" system, which was based on allocation of land in return for service. The king would give out grants of land to his most important noblemen (barons and bishops), and each noble would have to promise to loyally follow him and supply him with soldiers in time of war. They did this at a special - kneeling before the king, he swore an oath with the words "Sire, I become your man." The nobles then divided their land among lower lords, or knights who also had to become their vassals(servants). In the lowest spot in society sat the peasants who worked on the land itself. They had almost no rights, tiny pieces of property - and no vassals.